Is Presidential Election Collation Centre Head Buhari's Niece? 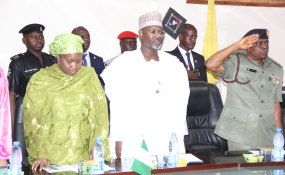 Amina Zakari with former INEC Chairman, Attahiru Jega. The People's Democratic Party (PDP) has rejected the appointment of Amina Zakari as the chairperson of INEC Advisory Committee and Presidential election Collation Center Committee. The party said it took the position because Mrs Zakari is President Buhari's niece. The PDP presidential campaign organisation made this known by its director, media and publicity, Kola Ologbondiyan, on Thursday, during a press briefing at the party's campaign headquarters. He disclosed this on Thursday while inaugurating two ad-hoc committees, as part of the commission's determination to ensure seamless preparations for the general elections. Mrs Zakari, a former acting head of the commission, is said to be Mr Buhari's relative. Mr Ologbondiyan, while addressing journalists, described the development as an "outright manipulation." "The People's Democratic Party Presidential Campaign Organization (PPCO) out rightly, vehemently and unequivocally rejects, in its entirety, the appointment of Mrs Amina Zakari, President Buhari's blood relation, as the head of the collation of results, in the same election in which his uncle, President Buhari, as a candidate, has displayed a huge desperation to win." "The appointment of Mrs Amina Zakari, who had been openly accused in various quarters as being the link person between INEC and the Buhari Presidency in their schemes to rig the election for President Buhari, constitutes a direct violence against the Presidential election and the PDP will not, in any way whatsoever, accept it." "This is the same Amina Zakari, who headed the ICT Department of INEC at the time that department was accused of manipulating the INEC voter register to accommodate fictitious, underage and alien voters, particularly, in remote areas where they plan to allocate and announce conjured votes for President Buhari and the APC." "It will interest Nigerians to note that this is the same Amina Zakari that was alleged to have played some roles in the 2018 governorship election in Osun State, where the electoral processes were flagrantly abused." "The fact remains that there is no way Amina Zakari will not allocate votes to her blood relation, President Buhari, whom Nigerians have indicated clearly that they are not ready to return to office as President." "With Amina Zakari at the head of results collation, there is no way votes cast by Nigerians will count," he declared. Mr Ologbondiyan called on all Nigerians, particularly, the National Peace Committee to note that with the appointment of Mrs Zakari as head the collation of presidential results, the INEC chairman is setting the stage for a very huge political crisis, which he said is capable of derailing Nigeria's democratic process. "If the INEC chairman wants a peaceful presidential election, he should, with the speed of light, reverse himself on this appointment." "The PDP remains committed to a peaceful and credible process, but we will never, in any way, allow anybody to use any means, under any guise whatsoever, to rig us out in this election. Not after it is clear that Nigerians have attained a consensus to rally behind our presidential candidate, Atiku Abubakar, as their next president. "All we ask for is a free, fair, credible and transparent electoral process in which the votes of Nigerians will not only count, but will be seen to have counted. "Like Mr President said during his 2019 budget presentation at the National Assembly, the world is watching us." INEC has not commented on the party's demand yet.